Need some privacy? Want to screen out the view into your neighbor’s yard? Consider planting a living fence of evergreen shrubs, but look beyond the common, disease-plagued Leyland cypress. In the southeast, hollies are a favorite for a long-lived, attractive, low maintenance screen. Several varieties are available that work well as hedges because of their upright growth habit. The varieties ‘Nellie Stevens’, ‘Oakleaf’, and ‘Emily Bruner’ all produce dense, dark green foliage year round and red berries that persist through fall and winter. Each of these varieties grows to 15-20 feet tall and 8-10 feet wide. Hollies grow best in sites with sun to part shade and well-drained soil, and are drought tolerant once established. Deer may browse the tips of holly branches but are unlikely to cause severe damage to these spiny-leaved plants. Upright evergreens work well as screens in narrow spaces because they take up little horizontal space. Two of the narrowest evergreens available are ‘Spartan’ juniper and ‘Emerald’ arborvitae, both of which grow 15 feet tall and only 3-4 feet wide. The main difference in these two plants is the conditions in which they prefer to grow. ‘Spartan’ is great for well-drained sites because it is very drought tolerant, whereas ‘Emerald’ prefers moist soils. Both grow best in full sun. If you need a columnar evergreen for a shady site, consider Japanese plum yew (Cephalotaxus harringtonia). While several low spreading selections of this shrub are available, the cultivar ‘Fastigiata’ will grow 10-12 feet tall and 6-8 feet wide. Japanese plum yew will grow in sun or shade and is rarely bothered by deer. Cleyera (Ternstroemia gymnanthera) is another relatively narrow upright evergreen that is great for hedges. This tough, adaptable shrub is covered in glossy green leaves. Cleyera thrives in sun or shade, is drought tolerant and deer resistant, and will grow 10-15 feet tall and 6-8 feet wide. Evergreens with showy or fragrant blooms provide a bonus feature for landscapes, providing seasonal interest as well as year round screening. Large evergreens with attractive flowers that can be used for screens include camellias and Fortune’s tea olive. Though slow growing, camellias make spectacular hedges, especially the fall blooming Sasanqua varieties like ‘Kanjiro’ and ‘Setsugekka’, each of which will grow to 10 feet tall. For best results plant camellias in moist, well-drained soil in a site with afternoon shade. 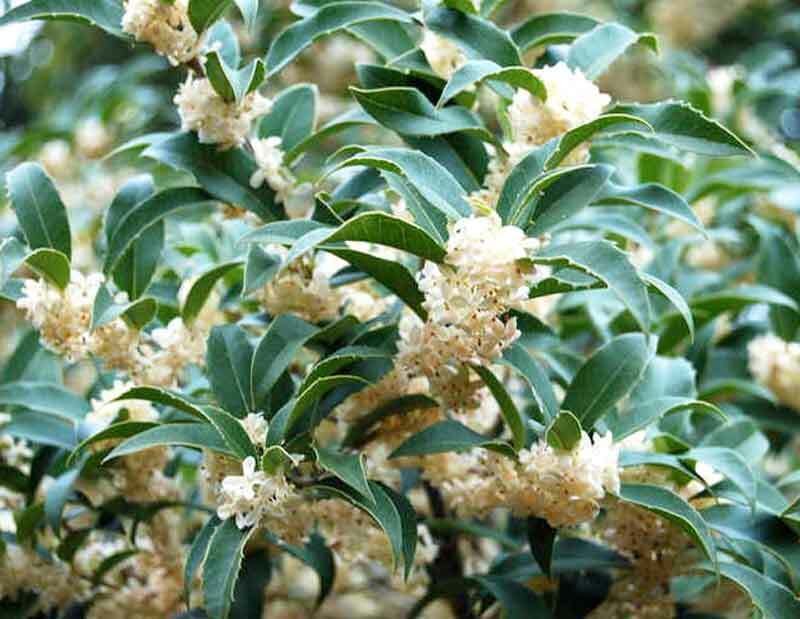 Fortune’s tea olive has clusters of small white flowers that line the stems in fall, allowing their exceptional fragrance to drift through the landscape. The leaves of this dense evergreen are slightly spiny, and are rarely browsed by deer. Fortune’s tea olive is a long-lived shrub that eventually reaches 15-20 feet tall and 10-15 feet wide. It’s a great choice for sunny or partly shaded areas where a large, impenetrable screen is needed. Charlotte Glen is the horticulture agent at NC State Extension’s Chatham County Center. Contact her at 919-542-8202. Visit chatham.ces.ncsu.edu for upcoming events and to post your questions online where you see the “Ask an Expert” icon.